Phenolic plywood is somewhat of a misnomer as it should more realistically be called “phenolic faced plywood.” The plywood itself isn’t made of phenolic, it’s generally made of birch. However, both surface veneers are soaked in phenolic resin before attaching them to the plywood; creating an extremely stable, smooth, highly water resistant and attractive surface. Like other high grade hardwood, phenolic plywood is made with a large number of layers. Depending on the manufacturer, a 3/4” sheet of phenolic could have from 13 to 15 layers. It is a void-free product, as with most cabinet grade plywood. The phenolic surface provides several advantages over other types of plywood products. Amongst the various types of plywood available, it is one of the toughest and most stable. The phenolic surface resists cracking and splitting from fasteners extremely well. At the same time, it provides a higher resistance to screw pull-out than you find with uncoated plywood. 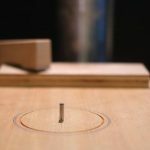 Since the phenolic surface is extremely smooth, it is extremely low friction, making it an ideal surface where other wood pieces would need to slide over it. While the phenolic provides for a high degree of water repellency, this is not the same as to say that phenolic plywood is waterproof. Unlike MDO (Medium-Density Overlay) and HDO (High-Density Overlay), the resin is only on the two faces, not used as an adhesive for the layers. Therefore, plywood can absorb water through the edges of the panel. When attaching pieces of phenolic, avoid the use of any types of adhesives. The smooth surface resists adhesives rather well. Therefore, building with phenolic plywood requires the use of fasteners, instead of adhesives. The most common use of phenolic plywood is in the making of jigs, fixtures, and cabinetry in the workshop. 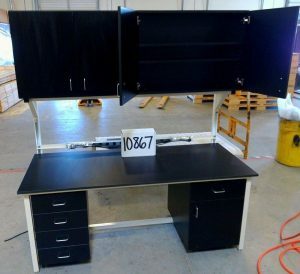 The low friction coefficient provided by the phenolic makes it extremely easy to slide work pieces across it when used as a tool table or fence. Phenolic plywood is gaining popularity for use in cabinetmaking. Although it does not provide for the same finishing options as regular cabinet grade or hardwood plywood, it does provide a smooth, clean, water repellent surface with consistent color. This is giving rise to the use of phenolic for cabinetry in laundry rooms, garages and other work areas of homes, workshops and businesses. For furniture or store fixtures, phenolic plywood can provide a rustic “warehouse” type of look popular in many casual clothing stores; while at the same time being extremely practical and attractive. The natural color of the panels eliminates the need for painting, while the stability and ruggedness insure that the fixtures will keep their good looks, without becoming easily dented, scratched or chipped. Another growing use of phenolic plywood is in the creation of cement forms. While it cannot provide for the same long life as HDO, mostly due to its lack of total waterproofing; for short-term uses it is excellent. The smooth surface resists adhesion from the cement, without having to oil the forms.